DIE Jovis, 17 die Januarii. King to be acquainted that the Poll Bill is passed. L. Mordant's Answer to the Impeachment of H. C. against him. Message from thence, with a Bill; and to return Ld. Strangford's. Message to H. C. that the Lords have passed it. King will come to the House, to pass Bills. ORDERED, That the Lord Chief Baron of His Majesty's Court of Exchequer is appointed to attend the Committee for the Bill to prevent the defrauding the King of His Monies, on Saturday next, at Three of the Clock in the Afternoon. The Duke of Albemarle was appointed by the House to signify to the King, "That the Poll Bill is passed both Houses of Parliament." The Lord Viscount Mordant gave the House humble Thanks, for giving him so long Time to advise for the putting in his Answer to the Impeachment of the House of Commons against him; and, in Obedience to their Lordships Command, now presented his Answer in Writing, with a Desire that the same may be communicated to the House of Commons. "The humble Answer of John Lord Viscount Mordaunt, Constable of His Majesty's Castle and Honour of Windsor, to certain Articles of Impeachment, exhibited against him by the Commons assembled in Parliament, for several High Crimes and Misdemeanors supposed to be committed by him. "Which concerns the Dispossession of William Tayleur of certain Rooms in Windsor Castle, about the Seventeenth of March, One Thousand Six Hundred and Sixty, the said Lord Viscount Mordaunt answereth, That he was very ignorant of those faithful Services Mr. Tayleur had done to the late King of Ever-blessed Memory, or of any Sufferings upon the Account of his Loyalty to Him; which had he known, they would have obliged him to a due Consideration of him; and doth affirm he is yet as great a Stranger to his Merits, as he was at that Time to his Person; and heartily wishes his Obedience and Integrity to His Majesty that now reigns could have justified that Character of him: But, to satisfy your Lordships how ill he deserved from His Majesty and the Lord Mordaunt in the Matters of this Article, saith, That, in the Year One Thousand Six Hundred and Sixty, when His Majesty was pleased, on His Grace and Favour, to confer upon him that important Trust of Constable and Governor of the Castle of Windsor, he found Mr. Tayleur in Possession of that House which belongs to the Chancellor of the Garter; that, the First Installation being presently to be solemnized, His Majesty was pleased, by His immediate Warrant of the Twenty-fourth of February, One Thousand Six Hundred and Sixty, to command, that within Twenty Days the Possession of that House, in habitable Condition, should be delivered to the Chancellor of the Garter; with which Warrant Mr. Tayleur being acquainted, and having perused it, positively refused to remove upon that Warrant; but he was advised by the Lord Mordaunt to consider better of it: However, he afterwards returned the same Answer, with somewhat more Stubbornness; and his Wife being importuned by his Lordship to persuade her Husband to yield Obedience, she said, she would acquaint her Husband with it: All those fair Ways being essayed, and finding no Obedience, rather than suffer His Majesty's Commands to be disputed by His Servant, and contumaciously disobeyed in His own House, his Lordship found it necessary, in Observance to the said Warrant, to command a Serjeant of the Garrison, with some few Soldiers, to remove his Goods and Family, yet with all Civility imaginable; which they punctually observed, and assisted them in carrying out their Goods. As to the Affrightment of the Child out of its Wits, his Lordship cannot think the Sight of Soldiers in Windsor Castle should have such Effect, the Child having been seen playing and well after that Time of Removal, and, as his Lordship is informed, was sick of the Worms, and this Affrightment never spoken of till this Occasion. 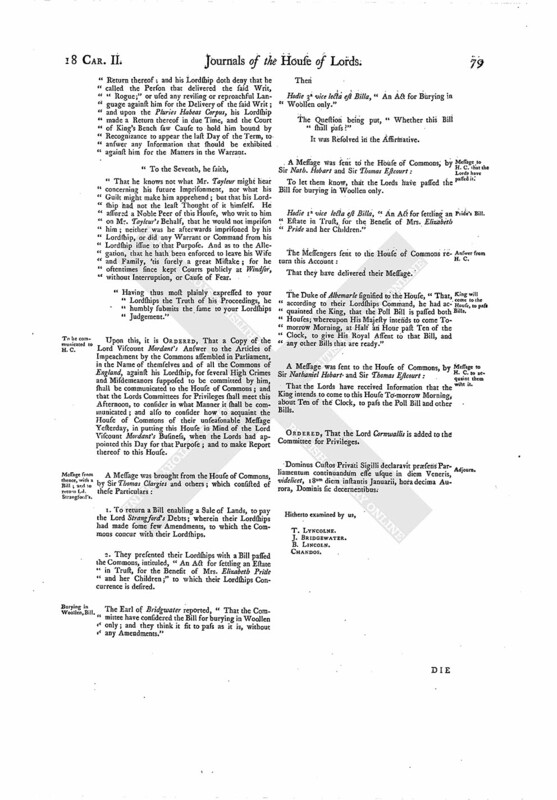 "The Dispossession was indeed by Soldiers; the King's Commands not being otherwise to be executed there, no Sheriff or other Civil Officer being permitted to come into the King's House and Garrison, by Order of the Place: And these were the only Causes of this Dispossession, and not any Concernment in his Election to Parliament, which is most evident, in that he did stand for Burgess, wherein the Election was free, and was elected by the Commonalty of the Town; but his Election afterwards was avoided by the House of Commons. As to the seizing Mr. Tayleur by Soldiers out of the Precincts of the Castle, and carrying him into the Castle, without Warrant or any lawful Cause, his Lordship faith, That the Time of his securing was Three Weeks before his Election; and that the Place where Mr. Tayleur was apprehended, was within the Jurisdiction of the Castle (as he taketh it), for that the Courts were there held by the said William Tayleur, as Clerk to the Constable of the Castle, who, being a Counsellor at Law, would not have kept Courts there as his Lordship's Deputy, if the same had been out of the Jurisdiction of the said Castle. And his Lordship faith, That he being informed and assured that the said Mr. Tayleur was not a Prisoner for Debt; and the said Mr. Tayleur having insolently disobeyed His Majesty's Commands concerning His own House, and spoken several scandalous and opprobrious Words against his Lordship and his Family, his Lordship did command an Officer and some few Soldiers to carry him to the Guard, where he was detained some few Hours, and after set at Liberty; and his Lordship denies that any Bail was tendered to him for his Enlargement: And his Lordship being Constable and Governor of the said Castle (it being then a Garrison for the King), and believing that it might be a great Encouragement to others to disobey Commands, if this Insolence were not taken Notice of and punished; these were the true Causes of his being sent for; and hopes it will not be imputed to him as done arbitrarily, or in Contempt of the Law, to which he hath always shewn ready Obedience, and hath asserted its Authority in the worst of Times, with the Hazard of his Life. "That, as Constable of the said Castle, his Lordship claims to have the Disposition of several of those Offices in Possession of William Tayleur by colour of his Patent; but denies any contemptuous Words spoken of the King's Great Seal, or otherwise than to the Effect and Purpose to vacate his Patent, which his Lordship was informed by his Counsel to be void in Law. "His Lordship denies any uncivil Addresses to Mrs. Vachell, or of any Threats of Ruin to her Family, as mentioned in the Article. "That there were several Rooms in the Timber Yard in the Possession of the said William Tayleur, all which (except such as he claimed to belong to him as Surveyor of the said Castle) did belong to several Artificers, to some by Patent, and to others by constant Usage and Enjoyment; and that, by His Majesty's Order under His Privy Signet of the Twentyeighth of February, One Thousand Six Hundred Sixty and Four, the Rooms belonging to the Artificers of the said Castle are commanded to be restored to them; and, that his Lordship might be sure to do no Man Injury, he desired several Gentlemen of the Neighbourhood, who had been well acquainted with the Offices and Usage of the said Castle (whereof the said William Tayleur was One), to make Enquiry, and certify concerning the said Rooms; which all of them (except Mr. Tayleur) accordingly returned, "That the Rooms possessed by the said William Tayleur belonged to divers Artificers;" whereof Mr. Tayleur having Notice left at his House, his Wife and Family there refused to deliver Possession according to His Majesty's Commands, but instead thereof returned reviling Language; and at this Time when he was removed from the said Rooms, the said William Tayleur was suspended from the Place of Receiver by an Order of His Majesty and Council, and Mr. Dudley Rouse placed in the said Office, the said Rooms claimed to belong to the said Office were delivered to the said Person that was placed in the said Office, and the rest to the Artificers to whom they belonged; but the Rooms as Surveyor are still in his Possession, without any Disturbance. 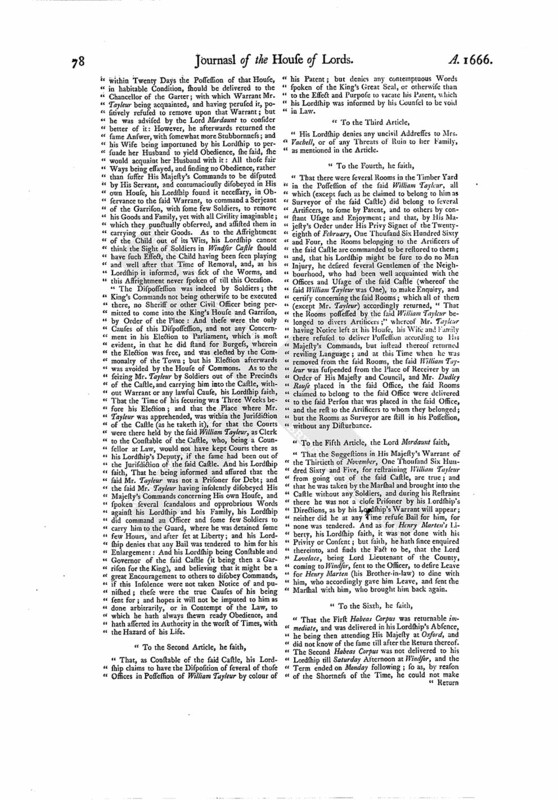 "That the Suggestions in His Majesty's Warrant of the Thirtieth of November, One Thousand Six Hundred Sixty and Five, for restraining William Tayleur from going out of the said Castle, are true; and that he was taken by the Marshal and brought into the Castle without any Soldiers, and during his Restraint there he was not a close Prisoner by his Lordship's Directions, as by his Lordship's Warrant will appear; neither did he at any Time refuse Bail for him, for none was tendered. And as for Henry Marten's Liberty, his Lordship saith, it was not done with his Privity or Consent; but saith, he hath since enquired thereinto, and finds the Fact to be, that the Lord Lovelace, being Lord Lieutenant of the County, coming to Windsor, sent to the Officer, to desire Leave for Henry Marten (his Brother-in-law) to dine with him, who accordingly gave him Leave, and sent the Marshal with him, who brought him back again. "That the First Habeas Corpus was returnable immediate, and was delivered in his Lordship's Absence, he being then attending His Majesty at Oxford, and did not know of the same till after the Return thereof. The Second Habeas Corpus was not delivered to his Lordship till Saturday Afternoon at Windsor, and the Term ended on Monday following; so as, by reason of the Shortness of the Time, he could not make Return thereof; and his Lordship doth deny that he called the Person that delivered the said Writ, "Rogue;" or used any reviling or reproachful Language against him for the Delivery of the said Writ; and upon the Pluries Habeas Corpus, his Lordship made a Return thereof in due Time, and the Court of King's Bench saw Cause to hold him bound by Recognizance to appear the last Day of the Term, to answer any Information that should be exhibited against him for the Matters in the Warrant. "That he knows not what Mr. Tayleur might hear concerning his future Imprisonment, nor what his Guilt might make him apprehend; but that his Lordship had not the least Thought of it himself. He assured a Noble Peer of this House, who writ to him on Mr. Tayleur's Behalf, that he would not imprison him; neither was he afterwards imprisoned by his Lordship, or did any Warrant or Command from his Lordship issue to that Purpose. And as to the Allegation, that he hath been enforced to leave his Wife and Family, 'tis surely a great Mistake; for he oftentimes since kept Courts publicly at Windsor, without Interruption, or Cause of Fear. "Having thus most plainly expressed to your Lordships the Truth of his Proceedings, he humbly submits the same to your Lordships Judgement." Upon this, it is ORDERED, That a Copy of the Lord Viscount Mordant's Answer to the Articles of Impeachment by the Commons assembled in Parliament, in the Name of themselves and of all the Commons of England, against his Lordship, for several High Crimes and Misdemeanors supposed to be committed by him, shall be communicated to the House of Commons; and that the Lords Committees for Privileges shall meet this Afternoon, to consider in what Manner it shall be communicated; and also to consider how to acquaint the House of Commons of their unseasonable Message Yesterday, in putting this House in Mind of the Lord Viscount Mordant's Business, when the Lords had appointed this Day for that Purpose; and to make Report thereof to this House. 1. 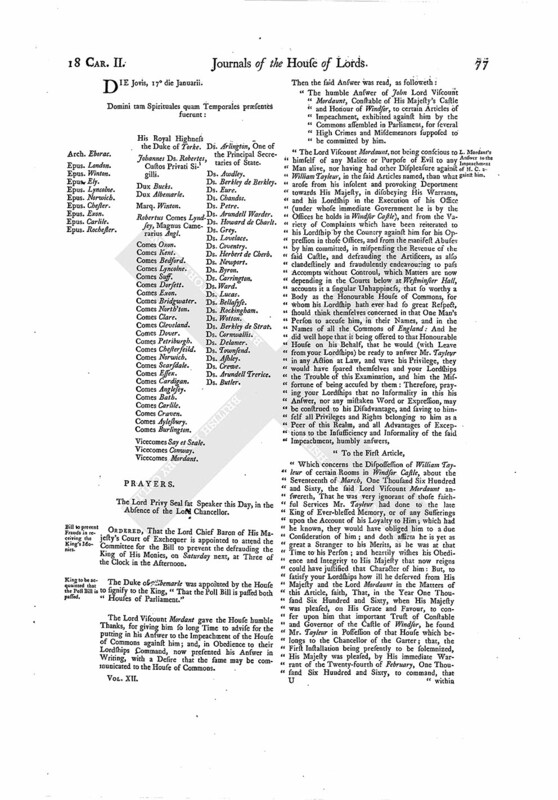 To return a Bill enabling a Sale of Lands, to pay the Lord Strangford's Debts; wherein their Lordships had made some few Amendments, to which the Commons concur with their Lordships. 2. They presented their Lordships with a Bill passed the Commons, intituled, "An Act for settling an Estate in Trust, for the Benefit of Mrs. Elizabeth Pride and her Children;" to which their Lordships Concurrence is desired. The Earl of Bridgwater reported, "That the Committee have considered the Bill for burying in Woollen only; and they think it fit to pass as it is, without any Amendments." Hodie 3a vice lecta est Billa, "An Act for Burying in Woollen only." To let them know, that the Lords have passed the Bill for burying in Woollen only. Hodie 1a vice lecta est Billa, "An Act for settling an Estate in Trust, for the Benefit of Mrs. Elizabeth Pride and her Children." The Duke of Albemarle signified to the House, "That, according to their Lordships Command, he had acquainted the King, that the Poll Bill is passed both Houses; whereupon His Majesty intends to come Tomorrow Morning, at Half an Hour past Ten of the Clock, to give His Royal Assent to that Bill, and any other Bills that are ready." That the Lords have received Information that the King intends to come to this House To-morrow Morning, about Ten of the Clock, to pass the Poll Bill and other Bills. ORDERED, That the Lord Cornwallis is added to the Committee for Privileges. Dominus Custos Privati Sigilli declaravit præsens Parliamentum continuandum esse usque in diem Veneris, videlicet, 18um diem instantis Januarii, hora decima Aurora, Dominis sic decernentibus.